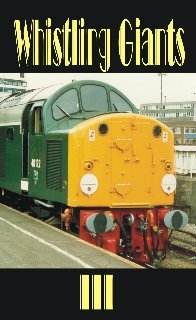 This is a real BLOCKBUSTER to finish off our three part series with views of class 40s from 1958 to 2005. Highlights are too many to list in full but include historic clips of the Derby, Ashford & Brighton prototypes in action with scenes featuring 10001,10202 & 10203. Soon after we see brand new EE type 4s at Stratford depot in 1958 and D200 speeding through the station on an express. The programme moves further through the green and blue eras with views of the type 4s at Nottingham Victoria, Sheffield Victoria, Grantham, Doncaster, Crewe, Carlisle, Manchester, Birmingham New St & Snow Hill, Edinburgh, Dundee, the North West, North Wales – and even Penzance! We also include another of the popular chapters on railtours and preserved examples before bringing us right up to date with marvellous views of D345’s famous return to the main line. This is an extended programme featuring almost a quarter of the whole class. All scenes are in full colour.